My feet have barely hit the ground this weekend. A bit like these guys…. 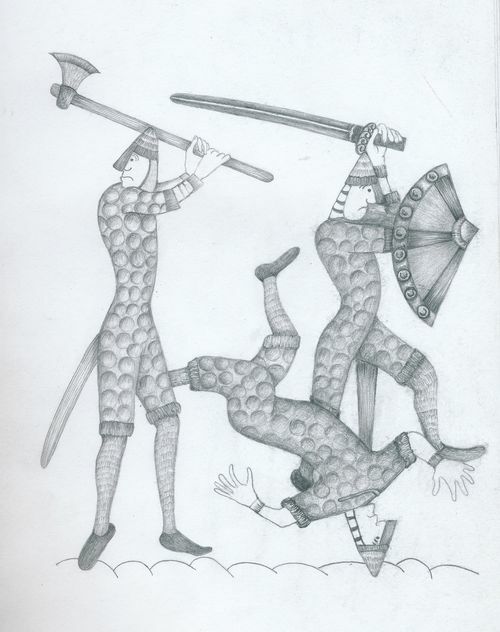 this is one of the illustrations I'm working on for the Bayeux book. The film festival is taking a lot of my time. Each documentary I've viewed has left me extremely reflective. After a hectic day and a birthday party for a 7 year old Keith and I attended the Documentary. Shlomi Eldar restores your faith in what journalism can be. He unashamedly uses his influence to highlight the case of a Palestinian baby in need of a bone marrow transplant to save his life. We were able to chat with the maker of the film through skype on the Movie screen. This film won the equivalent to an Oscar in Israel…. and will be shown on HBO in USA in a few months. It's compelling viewing. Next PostThe things you see.!!! !